Is Poverty like a Pond? Political libertarians are a motley lot in terms of their moral philosophies. There are three dominant strands – utilitarians like Milton Friedman, deontologists like Robert Nozick, and teleologists like Ayn Rand – but I’ve also met egoists, postmodernists, and Rawls-style egalitarian consequentialists. In debates over moral foundations, Randians often ally themselves with the deontologists in support of “natural rights” (a bit of a misnomer, as deontologists prefer not to locate the source of rights in “nature” but in reason). Critical Review editor Jeffrey Friedman, a utilitarian, used to say that rights libertarians are more dogmatic than utilitarians on questions of social science. He was extremely skeptical of the line of argument, commonly found in Rothbard, that libertarian policy X is justified on the grounds of both liberty and utility. What are the chances that the world just happens to line up in such a way that perfect justice and liberty also maximize social welfare in every instance? He calls himself a “post-libertarian” in part because he believes that the empirical evidence is unsettled as to the frontiers of the proper (i.e., utility-maximizing) roles of government. And he believes that it is a mark in favor of utilitarianism as a moral philosophy that rights libertarians are extremely reluctant to admit that any of their policy conclusions might not maximize social welfare. Which leads me to this question: is boxing immoral? Should it be banned (note: it is banned in several states)? Boxing should not be banned, even thought it may well be a dangerous, imprudent and immoral thing to do. There is no justification for using the coercive power of the state to interfere in people’s lives and prevent them from voluntarily deciding to fight for money. I have a hard time seeing any sound reason to disagree with Ralf on the legality issue. But is it immoral? Bader argues that we may have a Kantian duty of virtue (not a duty of right) to avoid it since the aim of boxing is to intentionally inflict harm on others (even though participants consent). However, I’m not so sure it is all that clear cut from other perspectives. An act utilitiarian would certainly have to favor boxing since it is hard to imagine, especially given its consensual nature, that it doesn’t increase general utility (especially since the duration and intensity of the pleasure of those who watch and love the sport is likely to far outpace the pain of those who disagree with the activity. On the negative side, the duration of the pain of those who get injured fighting is likely to be long lasting [and participants may have an excessively high discount rate on the possibility of long-term harm] – but there are a lot of benefits accrued to participants as well). 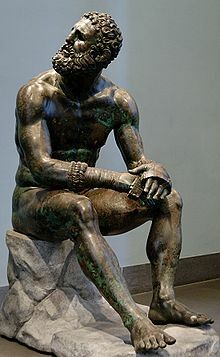 If one uses a virtue ethics approach, one could argue that boxing is inconsistent with human flourishing since it can lead to damage to the human body, especially the keystone faculty of reason. However, the same could be said for a number of other sports as Bader discusses (which might lead us to the unfortunate conclusion that sports like rugby and football, as well as cheerleading, are immoral). But much of the training that goes into boxing is good for participants’ health and the training lifestyle contributes to temperance. And the “sweet science” can train us to have greater courage and discipline. Indeed, its education in the “manly virtues” is a net plus – not to mention leading to a certain joy of living (and the satisfaction of independence gained from going toe to toe with another man with no help but one’s own head, heart, and fists). So, is boxing immoral? I’ve only hit on a couple of possible approaches, so there are likely a lot of other interesting takes out there worth thinking through. As I see it, moral philosophy is the derivation of valid principles for normative judgment, where normative judgment is the making of (true) statements about whether particular types of conduct are and are not justifiable. Now, I don’t see how making normative judgments without a unified, underlying principle or rule is possible. After all, we can’t have it all – we can’t have a society that combines perfect liberty, perfect equality, and absolute security. We have to make tradeoffs, but on what basis do we make those tradeoffs? We have to have a principle! To be precise, we have to have one and only one principle. If there are multiple moral principles, they can always come into conflict, and we will have to rely on a more fundamental principle to adjudicate the conflict. More fundamentally, I just don’t think it’s quite right to view moral judgment as a process of making tradeoffs among values. This point of view implicitly assumes that we’re trying to maximize some kind of function, in which our values (liberty, equality, security, etc.) are variables. That sounds a lot like stealth utilitarianism. Defending utilitarianism is fine, but it should be done forthrightly, not slipped in through the back door. Are liberty, equality, and security valuable only insofar as they promote the aggregate happiness of Homo sapiens (or perhaps the entire animal kingdom?). Rather, most defenders of liberty and equality see these terms as shorthand for principles of justice (any view that fails to equate “security” with a form of “liberty” is just confused). Thus, a Marxist sees the employment contract as inherently and necessarily wrong and exploitative, while a libertarian sees that same relationship as an inviolable exercise of liberty. I don’t see any way these different positions can be “weighed and balanced.” They can only be reasoned back to first principles. On a final note, moral philosophy makes progress by tracing first-order arguments about justice back to their atomic particles, the basic principles on which they are based. It is deductive, not inductive, so we should not hold it to the same standard of progress as inductive science. By its proper standard, moral philosophy has actually made great strides over the centuries.